What are the "Amoeba Sisters" videos? A series of short, FREE science videos that demystify science with humor, relevance, and a lot of comics to help students connect to the content (drawn by Petunia). These educational videos center on Pinky's experience and certification in teaching science at the high school level. Her Texas teacher certification is in grades 4-8 science and 8-12 composite science (encompassing biology, chemistry, and physics). Secondary life science, specifically, is Pinky's passion. are all less than 10 minutes to provide a foundation and provide more time for the important things: class discussion, exploration, hands-on labs, and student creation! have subtitles [click the CC button at bottom right of any of our videos in YouTube], in order to help make them more accessible. offer many translated subtitles! There are over 22 languages represented in translated subtitles (thanks to our awesome community)! Scroll down to learn more about this as well as how to contribute subtitles in different languages. Where do I find all of your videos? All of our videos are on our YouTube channel, and we suggest bookmarking our official Amoeba Sisters YouTube Biology Playlist. Please subscribe to our channel to be notified when we create a new video! Since YouTube is our chosen platform, check out some of the quick YouTube tips we have learned along the way of our adventure that may optimize your experience. What if YouYube is completely blocked in my school/district? YouTube is not blocked on my internet network, but I am still not able to see one (or more) of your videos? (1) You may be playing the video within a school/district network or on a school/district device that made a change to their filter settings. Depending on filter changes, this can affect the ability to view some videos on YouTube. We do want to point out that enabling YouTube's "standard" restricted mode (which many school districts like to use to block inappropriate videos/YouTube comments) will not affect our videos. Our videos will still play on YouTube's "standard" restricted mode! However, some districts and institutions enable additional filtering in addition to YouTube's standard restricted mode that can affect viewing of videos, including ours, on YouTube. This information here in this blog from Google may be helpful. It shows how a school district can choose to turn on the ability to view certain videos/enable certain channels on their settings even if they have turned on a more strict filter setting. School districts may not be aware of these controls and sharing this with your tech department may provide a solution. Not sure if what you are experiencing is related to filtering? Check to see if videos are missing or inaccessible from our official playlist- as of March 2019, we have 60 videos there (with an additional video typically added monthly). (2) Are you getting a message that the video cannot be viewed on your own personal device away from your school/district network? Check out this information from YouTube with some potential fixes related to browser errors or internet speed here. I teach an online or blended learning course. Can I post your videos? Since you first started in 2013, do you delete old videos? Generally no---with a very rare exception if we identify a major issue/error within a video. We do not like to delete our old videos. In fact, you can find our original first video on enzymes from the very beginning that we created in 2013, despite this video being updated years later. Deleting videos makes the YouTube video link/YouTube video embed code no longer functional. Besides not wanting to destroy the YouTube link, we choose to not delete our old videos because we want people to know how much we've improved as creators by sheer practice. When we update an old video, we leave the video up, and we put in parenthesis "(Old Video)" next to the title so that viewers know there is an updated one available that they can choose to watch instead. Old videos may not show in our biology playlist, but this does not affect the video link or video embed code. So how do you handle video edits or corrections? YouTube does not make editing easy for edu creators, but we definitely encounter issues we need to clarify or correct. We have a blog post here about how we handle this. Feedback regarding a need for a clarification or a mistake that we missed is very important to us as it continues to help us improve our work! You cover the basics of concepts I'm learning in my course. Do you have a recommended reference where I can learn more? It's important to question information that you find online. If you're looking for a textbook reference for science information (and to explore more about any concept), we highly recommend the FREE, peer-reviewed textbook OpenStax: https://openstax.org/details/books/biology. We list OpenStax as a suggested reference in all of our video details for anyone wanting to learn more beyond our secondary science (grades 6-12) concepts as Pinky has found it to be an excellent resource for biology fact checking. She also thinks the concept of an OER textbook is amazing. With a few of our more advanced concepts, we additionally include "further reading" suggestions in the video details which suggest science journals or resources. While our science videos cover life science concepts that are typically covered in secondary science textbooks (and something that Pinky has experience with teaching throughout the years), the way we address science concepts is a bit...different. See the next question. What grade levels are your videos designed for? Originally, our videos were designed for 9th grade biology. However, as we grew, we realized our videos can be used to support many life science standards covered in intermediate grades (6-8) so we frequently hear that our videos are used at the intermediate level as well. In 2017, we started creating videos on some more advanced biology concepts that may be covered in an advanced biology high school courses (or even some introductory biology courses at the college level). All of our videos can be found in our official playlist for browsing, but we also started listing our advanced concepts additionally in another playlist to make searching easier. There is more involved in DNA replication/ protein synthesis/ etc. than your video includes! Definitely. We frequently remind viewers that we cannot include all of the exceptions and details in a video under 10 minutes! Additionally, our videos are unique in that they use comics and cartoons. We find them to be memorable (and often humorous) visuals to the content, but we emphasize they're not scientific illustrations. Meaning, nitrogen and carbon don't tap dance. 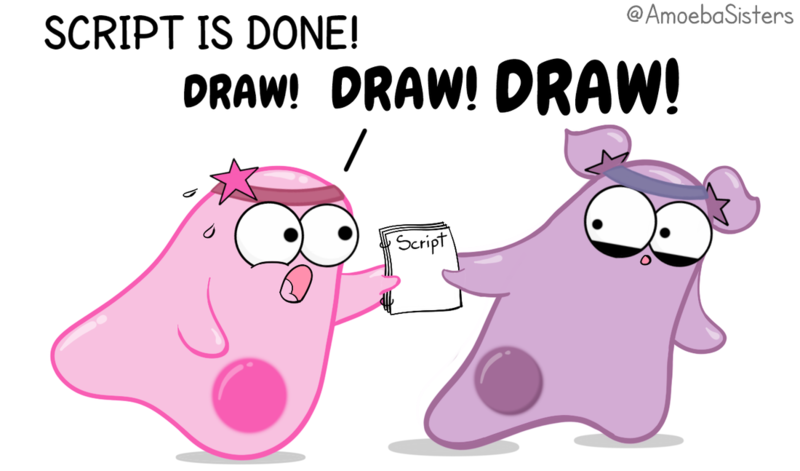 Our illustrated cell and molecule cartoons are definitely not to scale. Ribosomes don't have a mustache. 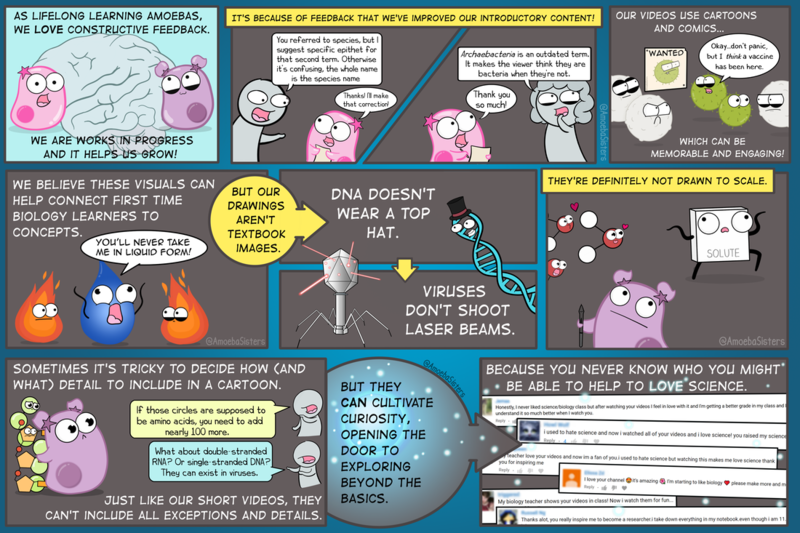 DNA is usually a right-handed double helix and it doesn't have eyes...a face...or a top hat... ​see our infocomic below! How do I check to see if you have a video on a specific topic? If we have it, it's in our official Amoeba Sisters YouTube video playlist. You can subscribe to our channel to be notified when we release a new video (which is then added to that playlist). I notice that many of your videos have resources that go with them? Yes, most of our videos do! Some resources are completely free and some we sell on Teachers Pay Teachers (TpT) to help support our work. If you'd like to learn more, click on the button below. Resources we have that accompany our videos. TpT allows teacher creators to support their work! TpT is free to join. TpT resources cannot be made available publicly online, as this would make us unable to support ourselves. You will find answer keys that we sell, which accompany the free website student handouts, linked on our handout page. We also have many of our answer keys in bundles, which are discounted from buying them individually. Answer keys offer convenience, and they also can be useful if you are new to the content. We offer a few "select handouts" that are not free unlike our regular recap handouts. Select handouts come with their own answer keys. While they are styled just like our regular free handouts in the grid format for exit ticket use, they tend to cover more detailed/less standard topics (such as the endosymbiotic theory or water properties). We offer annotated video script templates for some videos. They contain an informal version of our video script with slight improvements to define sentences and remove filler words to help with annotating. They have an annotation key asking students to (1) highlight foundation parts of the transcript that they already knew (which can be built upon), (2) highlight information that is new to them, (3) come up with their own questions, and (4) underline vocabulary. In addition, the template has a spacious, blank right margin for students to sketch concepts that are memorable or relevant to them. PS. All of our Unlectured Series topics already include an annotated video script template with them as that is an important component of the Unlectured Series Resource. How can I translate your videos? Translating our YouTube videos is a streamlined process! While voice-overs are not permitted, we have enabled YouTube's own community contributed subtitles feature so that anyone with a Google account can translate our YouTube video subtitles. Please help us reach others! YouTube gives the option for you to be credited as a subtitle contributor in the "video details" (you have to make sure to select to be credited or you will be anonymous to everyone including us!). If interested, here are instructions from Google about how to contribute subtitles on YouTube: https://support.google.com/youtube/answer/6054623?hl=en, and here is a quick screenshot video showing how you can see what languages exist for any current video that we have: https://www.youtube.com/watch?v=ALJcn-gD7Ac. Anytime we have a new translation for a video available, we try to tweet it out to let everyone know. How do I see translated subtitles for your videos? Our amazing community has helped us by contributing subtitles! Please see screenshot video above to see how you can click on any contributed subtitle language to see subtitles in a different language. ​Find an inconsistency in any of our subtitles (including English)? There's a form you can fill out on our contact page so we can correct it. May I request a topic for your videos? How often do you release a video? We are committed to releasing a video at least once a month. Sometimes we release two a month. We'd love to go faster, but the amount of edits that Pinky finds is inversely proportional to the amount of time before the release. If you would like to be notified every time we release a video, please subscribe to our channel. Do you provide trainings on video creation for teachers? Yes! Although we have to limit how many events we attend in this next year as we take on some new projects (and Pinky just had her second baby!). Please visit our 'speaking events and trainings' page where you can find our inquiry form. We are passionate about empowering both teacher and student creators. Which tools are you currently using to make your videos? We are not fancy. Our first videos started with programs such as Windows Paint (free), Windows Moviemaker (free), and a cell phone to record audio. This old tutorial video shows how we made many of our older videos, and you can see our milestones to see how we started. Our more recent videos have transitioned to some other software/hardware. Here is how we make our content currently. If you are considering creating videos, or having students create videos, realize that there are so many options. Check out our Student Creators page.